“In order to keep it,” says Bill W., “you have to give it away.” While not personally a big proponent of twelve step programs, I recognize the great good they have done for many people, and the universal applicability of some of the tenets, including this one. Sometimes holding on tight is the one way to lose something, and letting go is the one way to grow it. 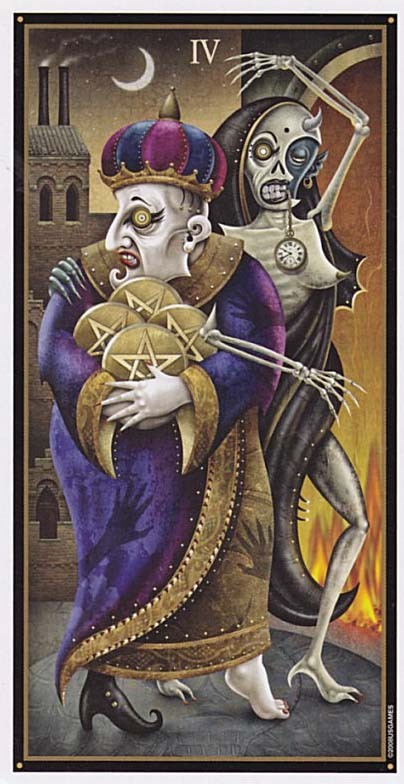 “I can’t complain,” says the Joe Walsh, “but sometimes I still do.” In the tarot card four of pentacles our wealthy man, dressed only in muddy browns, keeps a grip on his wealth in every way possible, completely absorbed in hanging on to the very pentacles which define him and crown him. The end result is he sits in a tight, tense little ball, isolated from the bright city behind him. He is a painful sight to see. He does not understand letting go in order to receive. And the results of our miserly four pentacles? 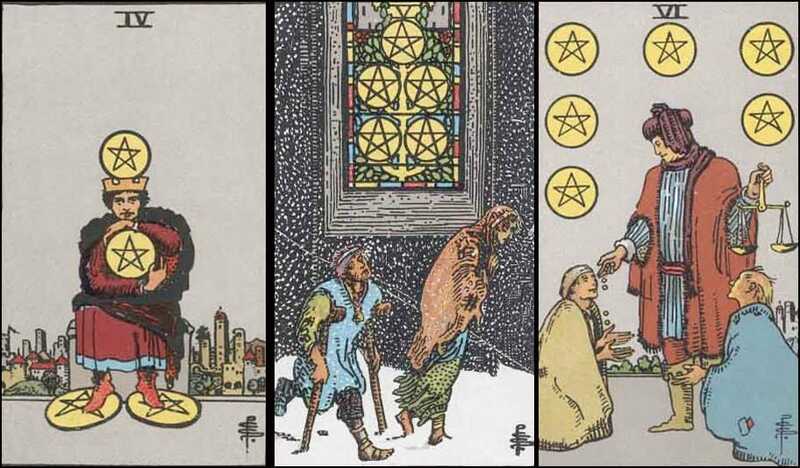 Five of pentacles: the misery of people bereft in the snow, excluded from the merest comfort, victims of have and have not. This is the world out of balance, two tarot cards showing a cause-and-effect of world economics. “We are not enemies, but friends,” says Abraham Lincoln, “…the mystic chords of memory will swell when again touched, as surely they will be, by the better angels of our nature.” In the six of pentacles our better angels revive, and the wealthy merchant, dressed in red of passion, blue of wisdom and white of spirit, is seen keeping a balance by giving away, in this case giving alms to the poor. Here he is not tightly bound by the pentacles, but they are arrayed around him as if stars in the firmament. It has been a very large part of my life journey to learn about taking and giving. Independence used to be my battle cry, until I was felled by physical disability and I had to learn about depending on other people for some of my most basic needs. The balance of giving and taking can become very fundamental, and in the face of such generosity as I have received I have struggled to learn to accept, and to learn new ways to pay it back, pay it forward. Not in the sense of dollars, and not person by person, but on the principle of what goes around comes around. We must give of what we have, whatever that may be. The wealth of the universe is not like the trickle of a creek in the desert, where each cup of water passes each point but once. It is like a great abundant ocean, made of tides and streams, ebbs and flows, unplumbed depths and even whirlpools of mysterious returns. In abundance one need not fear letting go of the little bits our neighbors need. Generosity may sometimes seem to be a sacrifice, a slicing off of a piece of what is yours and an alienation when it is transferred to someone else. This is a misconception. Generosity is not only a seeding of the universe, it is the seeding of your own self. As this three tarot card vignette shows, it takes giving away to maintain balance, not just externally but for the individual self as well. Pity poor Ms. Four of Pentacles. In order to keep it, in order to enjoy it, you have to give it away. Whatever “it” you have. The first Four of Pentacles card is from The Deviant Moon Tarot deck. 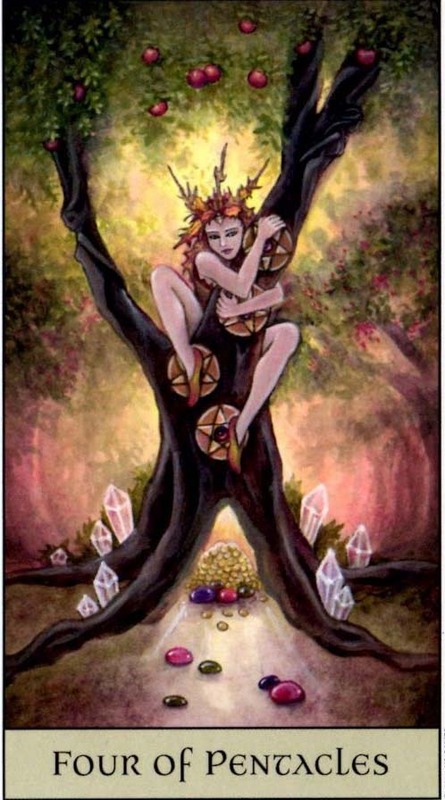 The second Four of Pentacles card is from The Robin Wood Tarot deck. 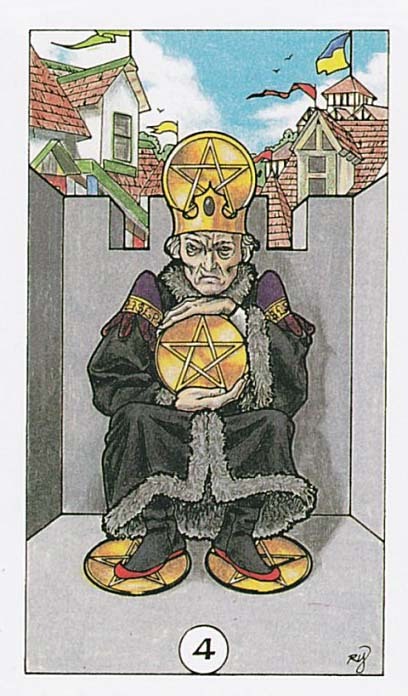 The Five of Pentacles card is unknown. Information is welcome. 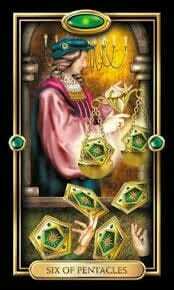 The first Six of Pentacles card is from The Gilded Tarot deck. 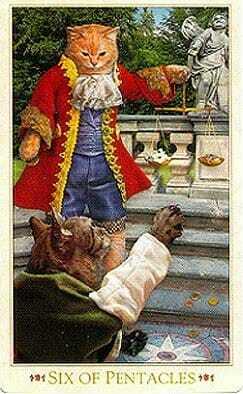 The second Six of Pentacles card is from the Baroque Bohemian Cats Tarot deck. 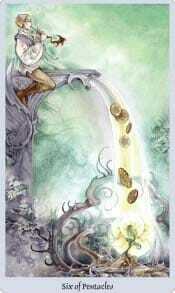 The third Six of Pentacles card is from the Shadowscapes Tarot. 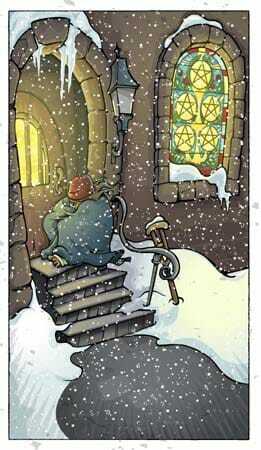 The last Four of Pentacles card is from the Crystal Visions Tarot deck.